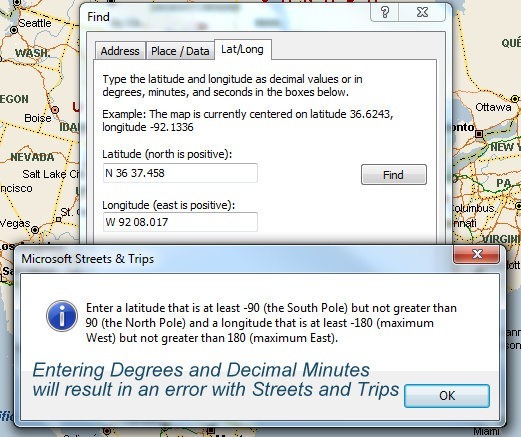 Microsoft Streets and Trips recognizes two types of GPS Lat/Long notation: 1) Decimal or 2) Degrees/Minutes/Seconds. 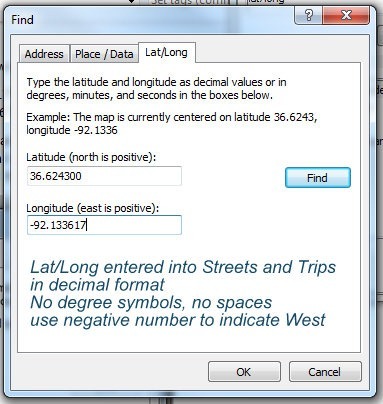 To enter the coordinates into Streets and Trips, you click on the Tools menu, Find, and click the Lat/Long tab. You can enter the coordinates in either of the formats above, but Decimal is the simplest. You don’t need the degree symbol – in fact, if you do include the degree symbol, you’ll get an error. Just use numbers, decimal points and the minus sign to show a West longitude. No symbols, no spaces. The problem with the coordinates from your Garmin is that they are neither Decimal, nor Degrees/Minutes/Seconds (DMS.) They are a kind of hybrid, starting out with degrees (36) , but expressing minutes in a decimal (37.458), thus eliminating seconds. If you try to put that into Streets and Trips, you’ll get an error. Even if you strip out the characters that it doesn’t like. So you need to convert the coordinates given from your Garmin to the Decimal coordinates that Streets and Trips will understand. There are several ways to do this. There are websites that do conversions. But I couldn’t find one that included the Degrees and Decimal minutes format. You can use Google Earth! 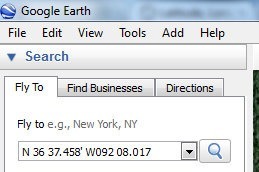 Google Earth is very flexible in the format of GPS Coordinates. 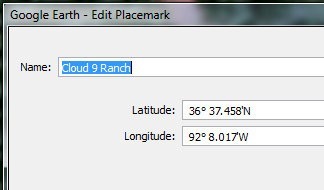 Enter the Degrees and Decimal minutes in the ‘Fly To’ field and Google Earth flies straight to Cloud 9 Ranch. Creating the Placemark is done with the Add menu, then click Placemark (or you can use the Placemark button in the toolbar.) When you create a Placemark, you see a dialog box open up where you can give the Placemark a name and you see the exact coordinates for the place. You can drag the Placemark around and you will see the Lat Long numbers change; or you can edit the Lat Long numbers and you’ll see the Placemark move. When you have the Placemark done, be sure to click OK to save it. Now, you want to go into Google Earth Options and change it to Decimal Degrees. Yours may already be set that way, in which case you would have seen the decimal notation in the Placemark dialog box already. To look at the options, and change them if needed, click on Tools, Options and make sure you’re on the first tab – 3D View. Notice that Google Earth has 4 choices! 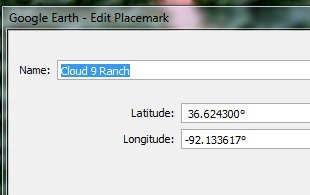 Choose Decimal Degrees (or whichever one you need) and then click OK.
Now, if you right-click on the Placemark and choose Properties (or Get Info on Mac) it will open the dialog box back up and you’ll see the Latitude and Longitude in the new format. You can repeat this process for as many different formats as you want! Just change the options to whatever notation you want, and then take a look at the properties of the Placemark to see the converted coordinates. Thank you so much. This information is a big help.